Do you have a badly hurting tooth? An injured tooth? A tooth that’s been completely lost? 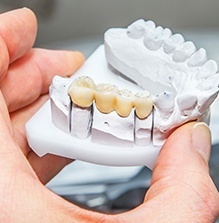 In these situations, a custom-made crown and/or bridge may be the best solution to help your smile get back on the right track. Here at San Pedro Smiles, Dr. Gonzalez offers both traditional and tooth-colored options for these high-quality restorations. Contact us today to schedule your first appointment here in San Antonio, TX! 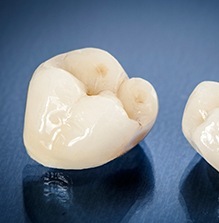 Dental crowns are designed to cover the entire visible portion of an individual tooth. They have a two-pronged effect by restoring both the tooth’s natural function and appearance while also preserving what remains of the original structure. Our team is likely to recommend dental crowns when teeth are badly weakened, decayed, hurt, incomplete, or cosmetically imperfect. They’re also commonly used to restore lost teeth that have been replaced with dental implants. 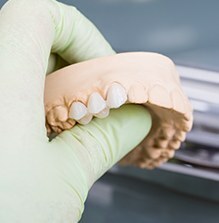 Dental bridges are sturdy restorations that literally “bridge” the space left by missing teeth. Dental crowns will serve as anchors that fit over the natural teeth on either side of the gap, holding the bridge firmly in place. With this replacement, patients won’t have to worry about a weak bite or their natural teeth gradually shifting out of position. They can get back to enjoying their complete smile!